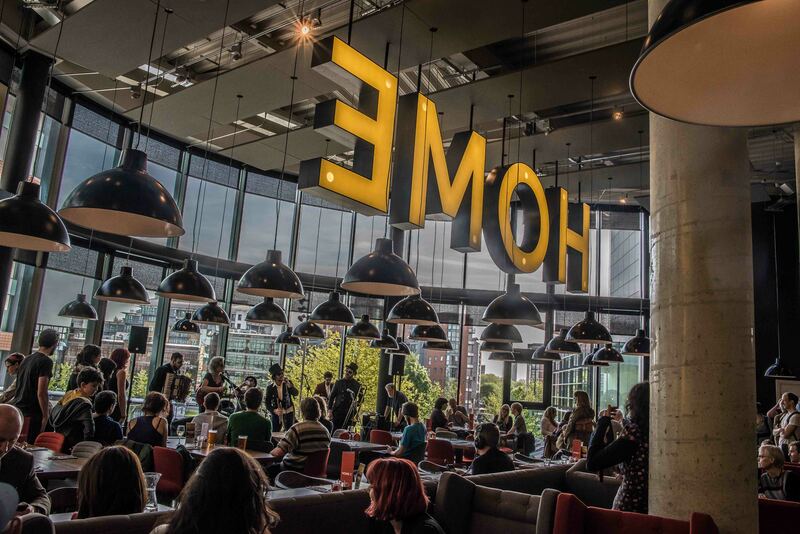 At the end of May, the team at HOME officially welcomed 28,000 visitors. 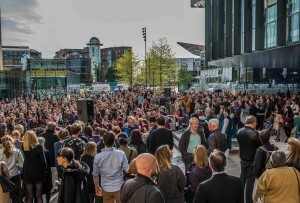 By their reckoning, The First Street Party on the Sunday was attended by approximately 11,000 visitors and the Café Bar served more than 400 pizzas from the outdoor ovens; almost 15,000 people visited the galleries to see opening group exhibition The Heart Is Deceitful Above All Things; 250 or so artists, film-makers, musicians and performers joined the weekend’s events, with 70 volunteers supporting events over the weekend; while over 500 visitors attended building tours, with more than 500 children taking part in the Inkheart building tours, The Story That Lived and The Incredible Book Eating Boy. All very impressive, of course, but nothing more or less than figures if the art and the spaces didn’t capture the hearts and minds of the HOME-comers (sorry, it’s catching). 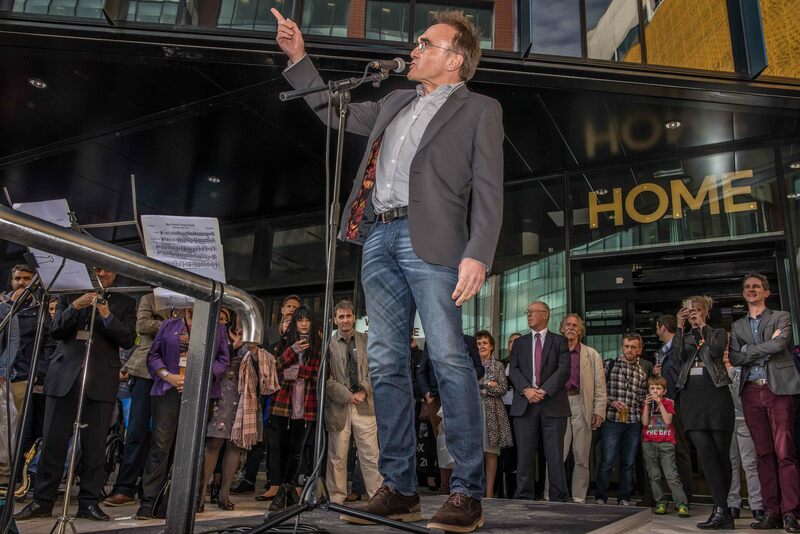 The first inkling that, after all the hard work and all the thinking and worrying, it really was going to prove as successful and significant as chief executive Dave Moutrey and his team had hoped came, fittingly enough, from patron Danny Boyle. After the pair of us, to the transparent irritation of various London-based national journalists helicoptered in for the occasion (result! ), had reminisced a bit about our days as slightly younger men watching films you simply couldn’t see anywhere else at the now long-gone Aaben Cinema in Hulme, then at Cornerhouse, Boyle admitted that he was “amazed, really, to see what’s been achieved here. I haven’t seen it in six months, since it was just a shell. To be honest, I’d expected something like the opening of Terminal Five at London Airport, which was a catastrophe that they had to spend ages afterwards apologising about to everybody. But, with the exception of the odd power tool still lying around, this whole building really is ready and waiting for all you guys. “The obvious thing to talk about, I suppose, is why HOME and why culture generally is so important to us all as a community. Of course culture runs through everything anyway, even if it’s being dismantled by the state by cutbacks. It’s in adverts, for instance, like an amazing one I just saw the other day, persuading you to switch to Vodafone but made, obviously, by whizz-kids who’d had some degree of cultural education. So it’s everywhere really and that’s sort of the old-fashioned argument. The crowds gathered outside in the early evening sunshine for the Funfair Fanfare (which heralded the official start of the HOME-warming weekend) heard Boyle echo those sentiments. 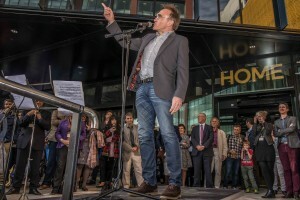 Before Boyle joined the throng, the leader of Manchester City Council, Sir Richard Leese, took the opportunity to explain that the council had flown in the face of the doom-predictors by contributing to the building of HOME. They did so, he said to spontaneous and heartfelt applause, not only because of the economic benefits that they’re smart enough to envisage (my words, not his) but because of one very pertinent question – “who the hell wants to live in a city without culture”? 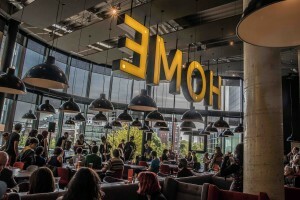 Cornerhouse, of course, was one of the very first places in the UK to establish that now-familiar model of an arts centre combining gallery spaces, cinema screens and food and drink. But a century earlier Manchester was the birthplace of the English repertory theatre movement, a tradition embodied more recently by the Library Theatre Company. So there was, to say the least, a certain amount of pressure on Walter Meierjohann, HOME’s artistic director for theatre, who had the press/opening night later on Thursday of The Funfair, a spectacular new adaptation by Stockport-born writer Simon Stephens of Odon Von Horvarth’s Kasimir and Karoline. Thankfully then, Meierjohann was unaware of an interval wine crisis, averted in large part due to the prompt and cheerful intervention of HOME patron Jackie Kay. Not content with proving her facility with words at yet another opening speech, Kay proved equally adept at pouring wine for the thirsty guests. What a splendid woman she is! While it’s fair to say that the play itself divided opinion on the night and continued to do so throughout the run, not even the sort of Library Theatre fuddie-duddies who would only be happy with versions of Lady Windermere’s Fan in perpetuity disputed the brilliant production values, the dash and verve of Meierjohann’s directing of the piece, or the superb facilities of Theatre One itself. 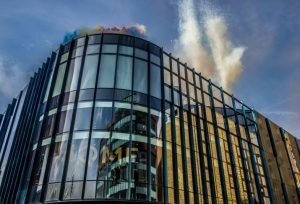 As it’s going to be a while before Theatre Two gets on its feet, plans are afoot to allow other theatre groups to use it in the meantime, reflecting the spirit of cooperation that seems to have finally broken out all over Manchester’s theatre-land. 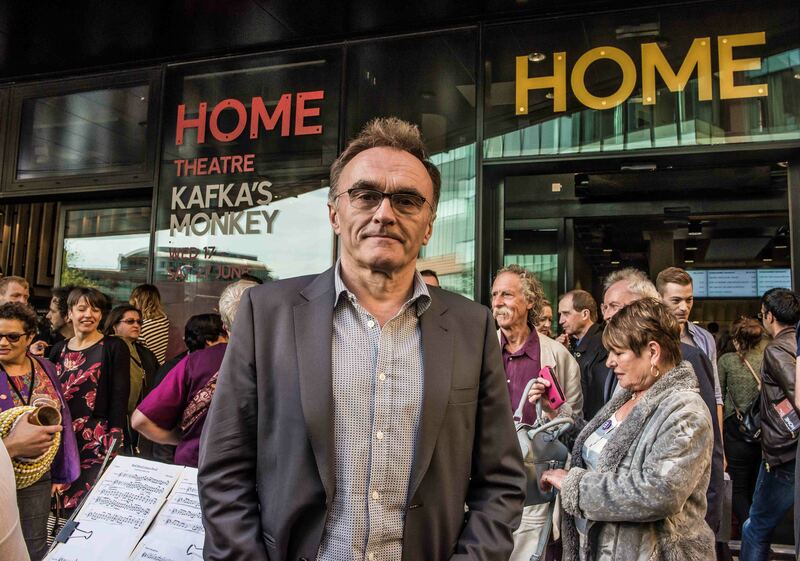 Meierjohann, meanwhile, is in no doubt that at least part of his mission is not only to draw in theatre-goers from across Manchester and the North West but also to position HOME as a major player on the European theatre scene. As soon as he became HOME’s artistic director for theatre, he tells me, he had planned to direct Kasimir and Karoline, widely acknowledged as a classic in Europe but relatively unknown in the UK. But it really fell into place when, in early negotiations with Stephens, it became apparent that Stephens was also a great admirer of the piece. When theatre-makers from all over the country gathered over the weekend at a deliberately provocative event called A Nation’s Theatre, chaired by The Guardian‘s theatre critic Lyn Gardner, there was some awe (and perhaps a little jealousy) at the confidence that a brave venture like HOME with its radical theatre policy could work in Manchester. 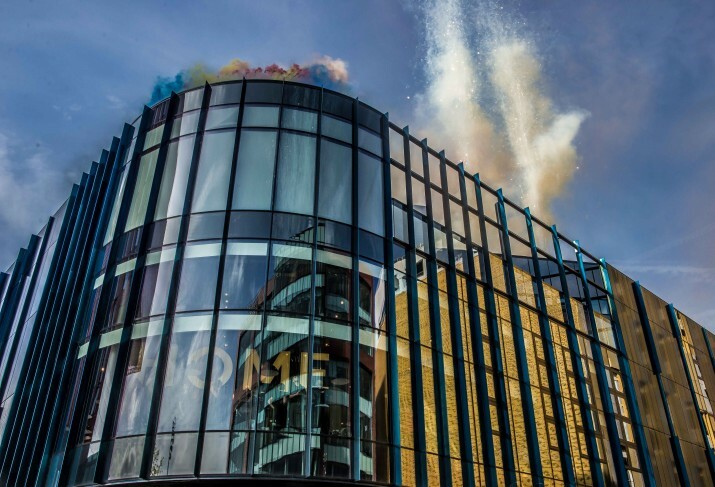 As artistic director of the Liverpool Everyman and Playhouse, Gemma Bodinetz is familiar with the challenges of rebuilding and re-energizing a well-loved institution. Meierjohann continues to help to “define HOME’s artistic approach and ambitions” with his new production featuring the incomparable Kathryn Hunter in Kafka’s Monkey, a show which was hugely successful for both Hunter and Meierjohann at London’s Young Vic, then on a world tour. “The response worldwide to Kathryn’s astonishing performance was truly gratifying and I’m delighted to be able to give audiences in the North of England the chance to see the show,” he says. “When you return to a show, it’s both easier and harder,” laughs Hunter of reprising her part as the monkey who has to become virtually a man in order to survive the cruel world of humankind. “Of course, it’s in the body and psyche memory, so that’s a plus when it comes to knowing the lines and the moves, but it’s what’s underneath that’s challenging, the inside motor that drives it which you have to call up again without repeating something mechanically. Cinema also got off to a rip-roaring start at HOME. New artistic director for cinema Jason Wood is obviously a genuine film fan and has brought wit, erudition and breadth of knowledge to the many audience participation sessions he’s already chaired. In the Q&A after the opening weekend’s Slow West – a brilliantly realised and genuinely thrilling tale set in the brutal Old West, written and directed by John Maclean and opening officially at HOME on June 26 – Wood revealed that one of his favourite genres is the road movie. That love should hold him in good stead now that ¡Viva!, Manchester’s annual and justly celebrated Spanish & Latin American Film Festival, has kicked off. This second of three long weekends across the year for ¡Viva! is focusing on new Mexican cinema with a line-up that boasts six films, including two UK premieres, two post-show Q&A talks, and a Spanish-language adult study workshop. Los Bañistas (Open Cage) directed by Max Zunino, is a tale of intergenerational conflict and solidarity set against the backdrop of a Mexico City in the throes of economic turmoil. The final screening is June 22, while Hilda, directed by Andrés Clariond Rangel, had its UK Premiere on June 19. A contemporary study of the corrosive effect of dysfunctional race, class, and gender relations, the film, by all accounts, is actually a lot funnier than that sounds. Paraíso (Paradise), screening over this weekend, is the second film by director Mariana Chenillo and, indisputably, a comedy about the perils and pitfalls of a couple moving from the countryside to the big city. The second UK Premiere of the weekend was Alejandra Sánchez’s political thriller Seguir Viviendo (Go On Living). This intriguing fusion of fact and reality features the moving tale of brother and sister Kaleb and Jade, played by the real siblings upon whom the story is based. Their lives are threatened after their political activist grandmother is shot and the duo travel round rural Mexico with journalist Martha, who is mourning the loss of her young son, killed in a car accident. The final festival screening is Güeros, directed by Alonso Ruizpalacios on June 22. Heavily influenced by the French New Wave but set in Mexico, the drama about two brothers on a mission to find an ageing former rock star is framed against a backdrop of student unrest at a university in Mexico City. The third and final section of the ¡Viva! Festival takes place between November 5-9, with the focus on New Spanish Cinema with film programme manager Rachel Hayward promising that, in the future, “¡Viva! will only grow more and also become a cross-arts event as befitting HOME’s multi-discipline status”. Inevitably that will involve the gallery space at HOME, whose forward thinking and flexibility as well as its opening group exhibition The heart is deceitful above all things has also been garnering universal praise. Yet again, Manchester is at the forefront of innovation in the arts and, to repeat the wise words of Richard Leese, “who the hell wants to live in a city without culture”?